In german language people see things „with new eyes“, when they adopt a new perspective and this is precisely what just happened to the ER. Nixon-Abell and co-workers used a whole array of „superresolution imaging technologies“ and produced a completely different view of this seemingly familiar organelle. 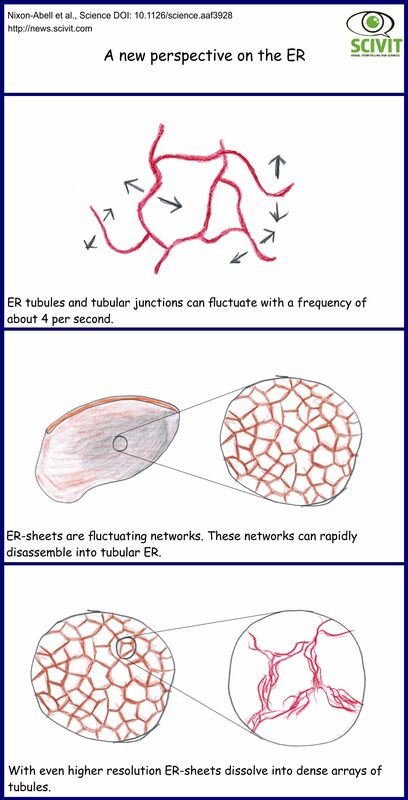 The starting point for their analysis had been the discovery that proteins known to form junctions in the tubular ER were located to ER-sheets. Overexpression of such proteins resulted in the proliferation of such sheets. This appeared somewhat wrong and when Nixon-Abell looked with the full power of modern microscopy they realized that ER-sheets are no sheets. They are rather dense arrays of closely packed tubules which, in addition, may fluctuate on a very small timescale. So we all have to revise the image we learnt at school or university. Nixon-Abell and colleagues added the caveat that there may be ER-structures, like the nuclear envelope which will remain sheet-like. Given the impact of the new technologies, the ER will certainly not be the last image we will have to revise.